Paige Hill: Happy Valentine's Day! Can you believe they're 15 and 18 now? Luckily I was helping in his class so I could bring them up:). The kids LOVED it and the cost was about the same as the usual buying the Valentines and adding candy). Fun times....Especially crafting with Mason! I hope you have a great Valentine's Day! 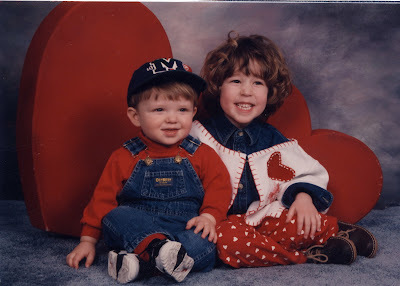 What cute kids. I may have to try and make your cute cardigan for my granddaughter. ahhh...times past and present, you must have loved that cardigan to have kept it. Nothing like the homemade valetines, for a minute I thought there was going to be hearts in a Mason jar! How fun to go to the school. What a cute cardigan - that's awesome that you didn't sew any of it with the machine! And I love the homemade Valentines. I made Jacob's too - he picked them out from a Family Fun magazine. I just love making Valentines! Paige your blog is so lovely. What fun to look at old photos of our children and so hard to believe how fast they grow...my youngest is 14years. I am off to grab your button and add it to my sidebar. Many thanks again for finding me xoxoxo. Why not frame this sweet cardigan and decorate your (bedd)room with it? So, so cute! I'm off to read some of your earlier post. Lovely blog! Paige...how adorable is that cardigan?! What a cute idea and I love the comment - someone suggested framing it? You could put a valentine in there too and a love note from you in the frame. Your kids would love it. I just found your blog and am absolutely in love with your Soda Valentines! What a most clever idea. While I enjoyed the finished product for my son's Valentines this year, I think it's the memories we created that were the most special. It looks like you have some wonderful ones with your children too. Thank you for sharing.